Yasuo is a sustained damage fighter with a very "Rurouni Kenshin" vibe. Riot games has just revealed the latest champion to join the ranks of its immensely popular MOBA: League of Legends. 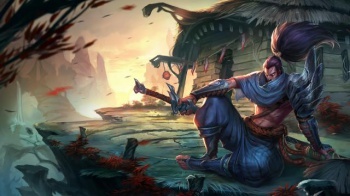 Yasuo, the Unforgiven is a new "sustained damage fighter," who has this whole "wandering samurai" feel about him. Yasuo has high mobility, strong utility and damage output that ramps up the longer he survives in combat. The tradeoff here comes in the form of low damage during his early game. Intent: Yasuo's critical strike chance is doubled. Resolve: Yasuo gains Flow as he moves - the faster he moves, the faster his Flow meter fills. When full, Yasuo activates a brief shield after taking damage from enemy champions or monsters. Yasuo thrusts forward with his sword, damaging all enemies in a line. Successfully landing Steel Tempest grants Yasuo Gathering Storm stacks for a short period. The third stack of Gathering Storm causes Steel Tempest to send out a whirlwind that travels in a line and sends all enemies caught Airborne. If Yasuo casts Steel Tempest during Sweeping Blade, the ability strikes all enemies immediately around him. Passive: Dashing replenishes Yasuo's Flow faster. Active: Yasuo creates a wall of wind that slowly drifts forward for a few seconds. The wall blocks all enemy projectiles. Yasuo dashes a fixed distance through an enemy, dealing damage and marking them briefly. If Yasuo uses Sweeping Blade multiple times in succession, the ability deals extra damage up to a cap. Yasuo cannot use Sweeping Blade on an enemy that's already been marked. Yasuo teleports to a nearby Airborne enemy champion, briefly suspending them and all surrounding Airborne enemies mid-air as he damages them. Once he lands, Yasuo gains significant armor penetration against his enemy's bonus armor for an extended period of time. You can read more about Yasuo on his official profile page.